Bill Ackerman was up in his bedroom changing into his sweats for his daily morning jog around the neighborhood when the phone rang. Calls in the morning at this time were almost always for his wife, usually one of her girlfriends wanting to chat. So he assumed his wife would answer. But the phone just kept on ringing. Ackerman looked out the bedroom window and saw his wife working at the side of their back yard on those new flower beds she had dug up. Normally when she worked out there she took the wireless phone with her, but perhaps she’d forgotten it this morning. So, since the phone kept ringing, Ackerman opened the bedroom door, went down the stairs to the phone table beneath the mirror in the hallway and lifted the receiver. A man. A deep-voiced man. Very certainly not one of his wife’s girlfriends. Ackerman was thrown a bit. “Hello?” said the deep-voiced man. “I beg your pardon?” said Ackerman. Some kind of click, a bit of static and then nothing from the other end. Again, nothing. Not even the clicks. Ackerman started to replace the receiver, then lifted it to his ear again. “Uh huh,” she said, making a tiny trench in the soil with her trowel. “Uh huh,” said his wife reaching over for a packet of seeds and tearing off one of the corners. His wife sprinkled the seeds along the tiny trench. His wife was now covering up the seeds and smoothing the dirt over with the top of her trowel. “Okay,” she said, starting to draw a new trench with her trowel. “I mean, please,” said Ackerman. Although, actually, when Ackerman thought about it—and he had to admit this to himself as he came back through the house and went out into the front yard to do his pre-jogging exercises—it certainly would be pleasant enough to think that that phone call had been for real, that that man was who he said he was, Clifford Barns, a special assistant to the President of the United States. Because—and, of course, this was pure fantasy—perhaps the President of the United States actually did want to talk to him. Get his advice on things. Because, to be honest and, as a matter of fact, Ackerman had developed something of his own views on the problems of the world since he had retired and had gotten into the habit of reading The New York Times every day. He had become more and more convinced that the United States needed to adopt a completely different strategy when dealing with other nations, even a radically different strategy, because—and this perhaps was no exaggeration—the very future of civilization might be at stake. And if that call was for real, that is, if that man really was a special assistant to the President and, also, the President really did want to talk to him, then there was a chance that he, Bill Ackerman, might finally have some kind of influence on something very, very important. Good God! Get a grip, Ackerman said to himself as he started off down the sidewalk in the direction of the park. He had no more than gotten up to his normal stride along the sidewalk when he saw his next door neighbor, Ed Finch, up on a ladder cleaning out his eves. Ed was a big, likable man who used to run a small plumbing firm before he retired, and now he spent all his time doing yard work. In fact, Ed’s yard looked far better than Ackerman’s. Actually, a hell of a lot better. Everything neat and tidy and even over-attended to. Ed was so concentrated up there on the ladder that Ackerman could have easily passed unnoticed, but he slowed and called out Ed’s name. Instead of just waving back, Ed started down the ladder. Ackerman explained how he had been changing into his sweats when the phone rang and he thought it probably was one of his wife’s girlfriends, but in fact it was a man who said he was a special assistant to the President of the United States. But the man had no more than said that when the line went dead. Suddenly Ed’s whole expression changed. “Uh huh,” said Ackerman, again extracting his hand from Ed’s. Ackerman was not much of a runner and, truth be told, not much of an athlete. But during his working years he had always promised himself that when he retired he would start jogging, and since his retirement he had managed to keep that promise more or less four mornings a week. Today he saw all the usual sights: the cowardly little dog that barked like crazy and ran back and forth behind a fence, the old woman who always sat on her porch and waved as Ackerman went by, the overweight postman making his rounds, the Starbucks café at the corner where people sat outside at the tables along the sidewalk and the usual gaggle of mothers with their baby buggies at the entrance to the park. But as Ackerman jogged toward the center of the park he didn’t see anyone on the path ahead of him. He let his thoughts wander. Suppose the President of the United States were to actually call him. Today. What would that experience be like? Well, he would certainly tell the President that he’d been giving the situation in the Middle East, for example, some serious thought. And, Mr. President, Ackerman heard himself saying, we have to think creatively, outside the box, so to speak. Perhaps a radical solution. Because things are moving fast in the Middle East. Gigantic forces are at work. Ah, yes, the President might say, yes, yes, I see what you mean. Because, Mr. President, we can either choose to be on the side of history or decide not to be on the side of history. A telling observation, Mr. Ackerman. And, of course, the news that the President had called would immediately get in all the newspapers, certainly the local ones, and the TV stations and radio stations would send reporters out to interview Ackerman and ask for his views on, say, the Middle East. And when he jogged like this, instead of that one woman who waved at him from her porch, hundreds of people would wave and parents would point him out and explain to their children who he was. William J. Ackerman, special assistant to the President of the United States. Ahead of him he could hear the traffic on the road—which meant that he had come to the end of the park. Get a grip! he said to himself. The park and the street marked the end of Ackerman’s daily jog. He always sat and rested for a while on a bench and then went over to Dawson’s drug store for a New York Times. On this particular morning he saw some teenage boys hanging out on the steps just in front of the drug store. As Ackerman approached, they didn’t give way. The boys barely moved aside. “Excuse me,” he had to say again. Dawson’s drug store was one of the hold-overs from at least fifty years ago, a long counter with stools, a row of candy bins, a display of tobacco products featuring different kinds of pipes and shelves with all kinds of odd things for sale. The back half of the store as well as the counter with stools had been recently roped off and now only used for storage. Fred, the owner, a thin, nervous type with worry lines on his forehead, always sat at his desk back behind some shelves and normally only came to the cash register when a customer actually wanted to pay for something. “Good morning,” said Ackerman leaning past the cash register so he could see Fred behind the shelves. Fred was working with a hand-held calculator entering figures in a ledger book. He didn’t respond to Ackerman’s greeting. Without really looking at Ackerman, Fred slipped himself out from behind his desk, reached up to a high a shelf, pulled out a New York Times and placed in on the counter. Ackerman pulled the exact change out of a pocket of his sweats and placed it next to the cash register. With a quick sweep of his hand Fred scooped up the coins and rang the sale up on the cash register, the white metal dollars and cents signs poking up into the display at the top of the machine. “Thanks so much,” said Ackerman. Fred, back at his desk, barely nodded. Ackerman stopped talking because he saw Fred take off his glasses and for the first time really look at him. And suddenly Ackerman felt ashamed and could even feel his face getting hot. Fred put his glasses back on and turned back to entering figures. Once more Fred lifted his head, looked at Ackerman, mumbled, “It takes all kinds,” and returned to his work. Ackerman waved but keeping on walking. Back in his own house he set The New York Times down on the little table next to the phone, bent over and took off his running shoes, put on some more comfortable slippers and went into the kitchen and poured himself a drink of orange juice. Then he went back into the hallway and looked at the phone sitting there on the table under the mirror. Going back into the kitchen he looked out the window and saw his wife at the side of the garden. “Have a good run?” she said as he came up to her holding his glass of orange juice. She was kneeling, working with her trowel on a new flower bed. Because, in a way, it came to him, this was the life. Jogging in the morning, four times a week, more or less, relaxing afterwards in his own back yard. Probably some errands this afternoon. Watching TV tonight. Not bad at all. “Oh? What?” said Ackerman keeping his eyes closed. Ackerman sat bolt upright and looked at her kneeling there. Ackerman stood up, spilling his orange juice, and broke out running to the house, passing through the kitchen and then into the hallway. He looked at the phone sitting on the table below the mirror and next to The New York Times. But it just sat there without doing anything. Ackerman went into the dining room, got a chair, brought it into the hallway and sat down on it. He waited for a while and then picked the receiver up. Nothing but a dial tone. He clicked the switch on the receiver cradle on and off and listened again. Still, just the dial tone. So he put the receiver back in its cradle. Maybe, he thought, if he waited long enough . . .
Ackerman realized that his hand was trembling as he reached for the phone. After all, what was about to happen might be the most significant moment in his life. “Hello?” he said into the receiver. Sally was one of his wife’s girlfriends. “Just a moment,” said Ackerman. He found the wireless phone in a drawer, turned it on and went out through the kitchen to the back of his garden where his wife was working. “For you,” Ackerman said handing the phone to his wife. “Sally! Hello! Oh, how are you!” said his wife standing up and holding the phone in one hand and the trowel in the other. Ackerman went over to the fence bordering their property and looked over into the Finch’s yard. Well, it was sort of a fence. It actually didn’t amount to all that much, just a set of wires he’d strung up when they first bought the house. But his wife had insisted on planting bushes along the wires and those bushes had really grown over the years were almost impenetrable now, so thick he couldn’t see the original wires anymore. Ackerman could hear the whir of Ed’s electric hedge trimmer. Actually, Ackerman wondered what in God’s name Ed was doing trimming the hedges even more because as far as he could see they already looked trimmed within an inch of their lives. As was the rest of Ed’s yard. As if his yard was more of a museum and wasn’t really real. And, now that he thought about it, what about those eves he had seen Ed cleaning. Probably they were almost empty. A few leaves; nothing more. Ackerman went over to where he’d spilled the orange juice, picked up the glass, glanced at his wife leaned all the way back on the lawn chair with the phone clamped against her ear, and headed back into the house. In the kitchen he placed the glass on the counter and continued to the hallway and saw the chair from the dining room where he’d placed it next to the phone table. This was the big question he asked himself: Should he carry the chair back to the dining room or leave it where it was? You never knew. Stranger things had happened in this world. He sat down on the chair and waited. Karl Harshbarger is an American writer living in Germany who has had over 90 publications of his stories in the Atlantic Monthly, Ploughshares, the Iowa Review, the Antioch Review, the New England Review, and Prairie Schooner. He has two “Distinguished Stories” in Best American Short Stories and thirteen Pushcart Prize nominations. 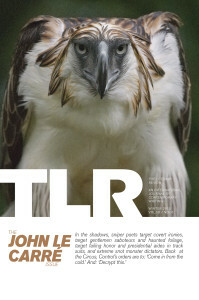 “It Takes All Kinds” was originally published in John le Carré (TLR, Winter 2015).